Mol. Cells. Jan 31, 2019; 42(1): 67-78. Mol. Cells.Jan 31, 2019; 42(1): 67-78. Received June 11, 2018; Accepted November 26, 2018. 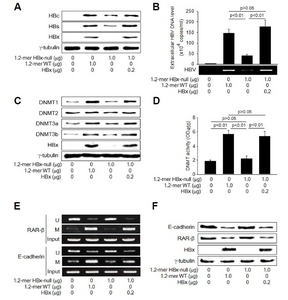 HepG2 cells were transiently transfected with either 1.2-mer WT HBV replicon or its HBx-null derivative for 48 h. For lane 4, HBx-expression plasmid was included. (A, C, F) Levels of the indicated proteins were determined by Western blotting. (B) Levels of HBV particles released from the cells were determined by IP-coupled conventional PCR and real-time PCR (n = 5). (D) DNMT activity was measured as described in Methods (n = 4). (E) MSP analysis was performed to determine whether CpG islands in the promoters of RAR-β and E-cadherin are methylated (M) or unmethylated (U) in the presence or absence of HBx. (A) HepG2 cells were transfected with 1.2-mer WT as described in Fig. 1 in the presence of an increasing concentration of 5-Aza-2′dC. For the determination of viable cell number, MTT assay was performed as described in Methods (n = 4). Levels of extracellular HBV particles were determined by IP-coupled conventional PCR. (B) HepG2 cells were transfected with either 1.2-mer WT or its HBx-null derivative for 48 h in the presence or absence of 5 μM 5-Aza-2′dC. Levels of extracellular HBV particles were determined by HBsAg ELISA (n = 5). 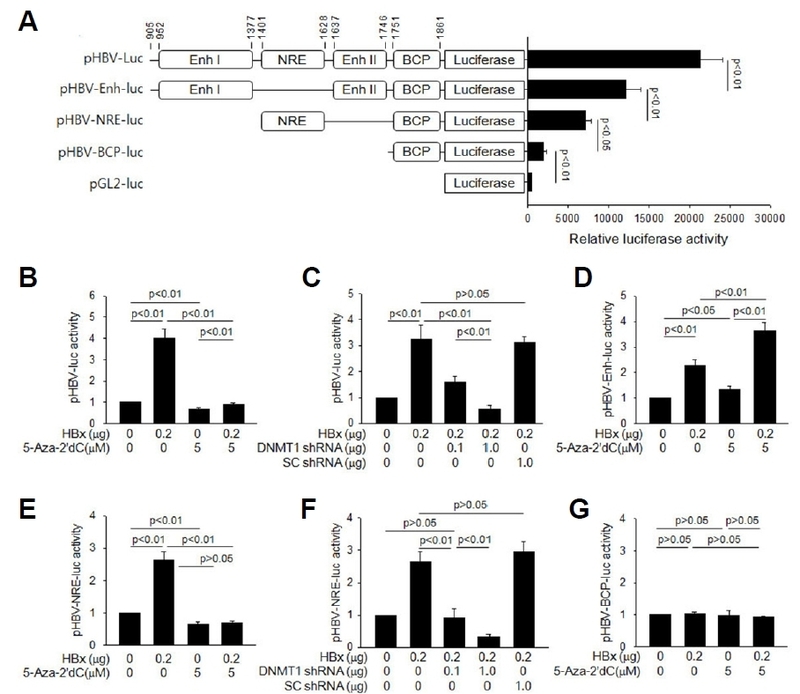 (C) Levels of intracellular HBV DNA and (D) extracellular virus particles from HepG2 cells prepared as in (B) were determined by IP-coupled real-time PCR (n = 6). 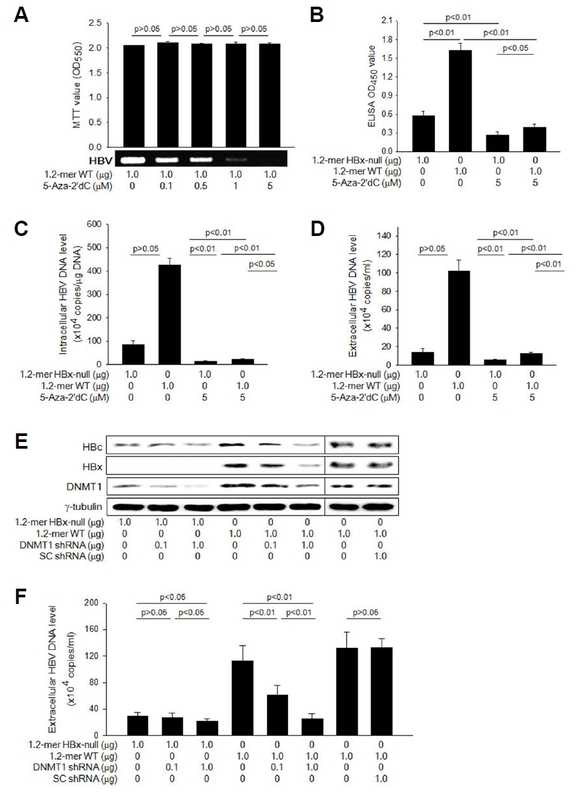 (E) HepG2 cells were transfected with either 1.2-mer WT or its HBx-null derivative along with the indicated amount of DNMT1 shRNA plasmid or SC shRNA plasmid for 48 h, followed by Western blotting. (F) Levels of extracellular HBV particles released from HepG2 cells prepared in (E) were determined by IP-coupled real-time PCR (n = 6). (A) Schematic representation of pHBV-luc and its derivatives. The basal luciferase activities of these constructs along with an empty vector pGL2-luc (Promega) were compared in HepG2 cells (n = 4). (B to G) Either an empty vector or HBx-expression plasmid was co-transfected with the indicated reporter construct into HepG2 cells for 48 h, followed by luciferase assay. The values indicate the relative luciferase activity compared to the basal level of the control (n = 4). (B, D, E, and G) Cells were either mock-treated or treated with 5 μM 5-Aza-2′dC. (C and F) The indicated amount of DNMT1 shRNA plasmid or SC shRNA plasmid was included in the transfection mixtures. (A) The complete nucleotide sequence of a cloned HBV genome (NCBI accession number X04615.1; Okamoto et al., 1986) was analyzed for the presence of CpG islands using the MethPrimer software. Positions of three CpG islands are shown (upper panel). 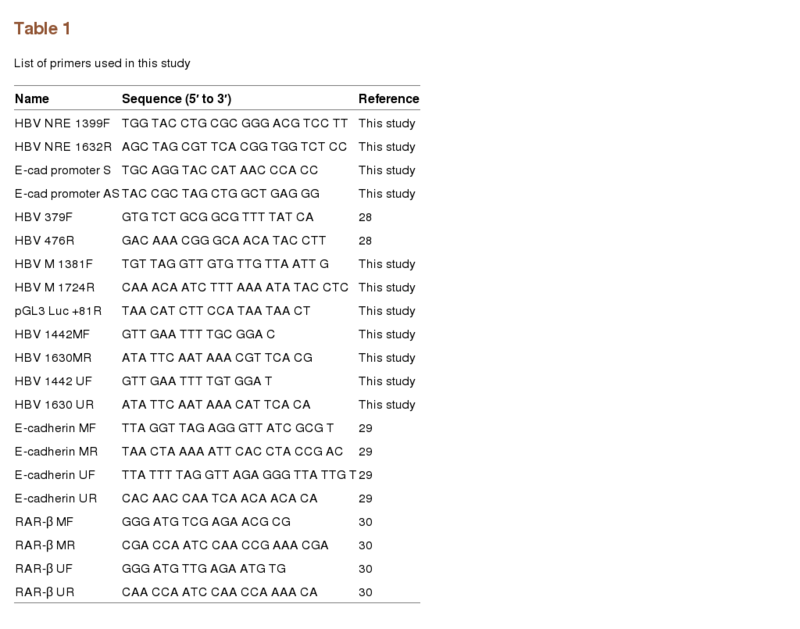 Bisulfite sequencing analysis was performed to determine methylation status of the NRE region from pHBV-luc and HBV cccDNA in the presence or absence of HBx (lower panels). 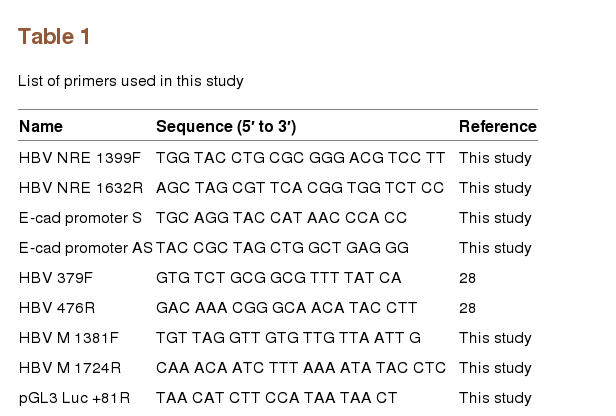 The CpG sites in the NRE (1397 to 1634) from five different clones are shown to be either methylated (filled circles) or unmethylated (open circles). Positions of a NREBP binding site and two MSP primers are indicated. (B) HepG2 cells prepared as described in Fig. 3B were subjected to MSP to determine whether the NRE in pHBV-luc is methylated (M) or unmethylated (U). 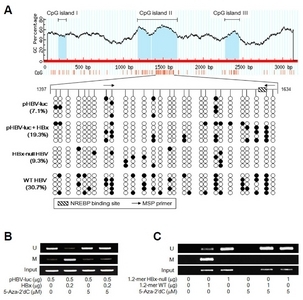 (C) HepG2 cells were transfected with an empty vector, 1.2-mer WT, or 1.2-mer HBx-null for 48 h in the presence or absence of 5 μM 5-Aza-2′dC, followed by MSP to determine the methylation status of NRE in HBV cccDNA. 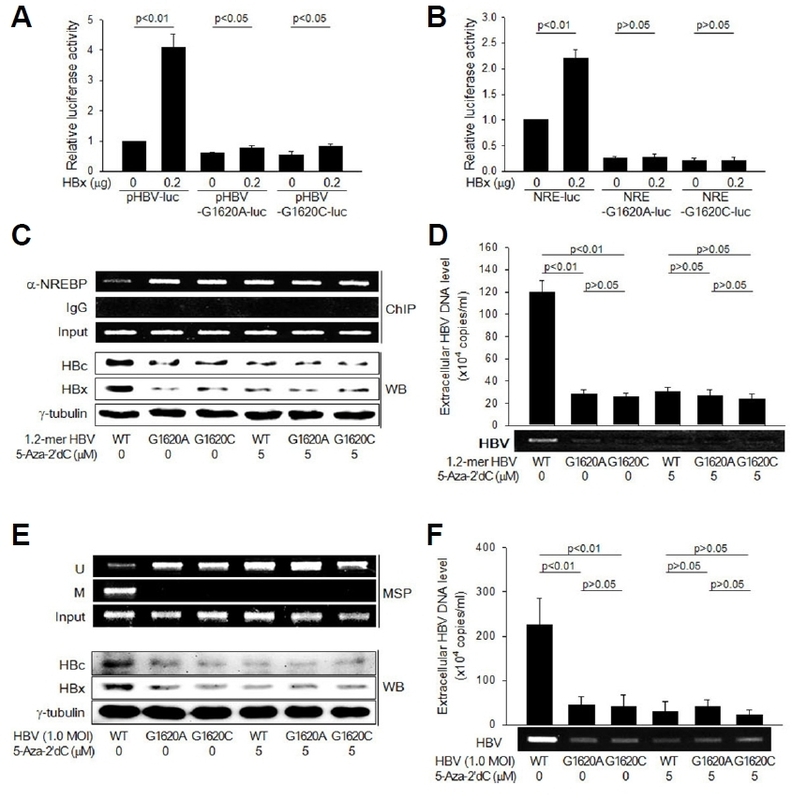 (A–C) HepG2 cells were co-transfected with pHBV-luc (A), pHBV-NRE-luc (B), or pHBV-Enh-luc (C) with either 1.2-mer WT or 1.2-mer HBx-null in the presence or absence of NREBP shRNA plasmid for 48 h, followed by luciferase assay (n = 5). (D) HepG2 cells were transfected with either 1.2-mer WT or 1.2-mer HBx-null with or without NREBP shRNA plasmid for 48 h. Levels of extracellular and intracellular HBV DNA and E-cadherin DNA as an internal control were determined by PCR (upper panels). Levels of HBx, HBc, and NREBP were determined by Western blotting (lower panels). 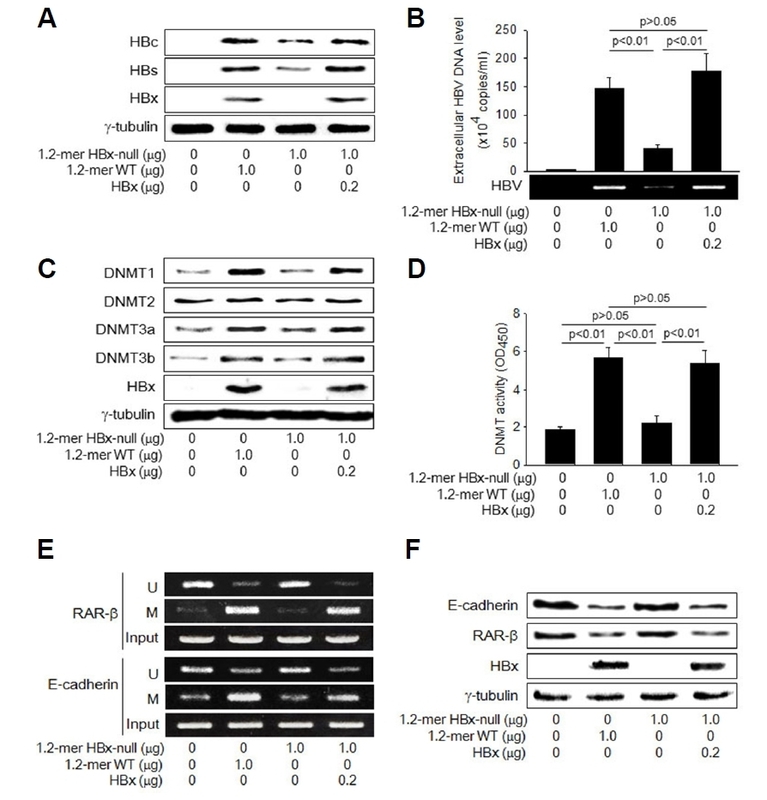 (E) HepG2 cells were transfected with either 1.2-mer WT or 1.2-mer HBx-null for 48 h for 48 h in the presence or absence of 5 μM 5-Aza-2′dC. ChIP assay was performed to determine levels of NREBP bound on the NRE of HBV cccDNA (upper panels). (A) pHBV-luc and its derivatives, pHBV-G1620A-luc and pHBV-G1620C-luc, were co-transfected with either an empty vector or HBx expression plasmid into HepG2 cells, followed by luciferase assay (n = 4). (B) pHBV-NRE-luc and its derivatives, pHBV-NRE-G1620A-luc and pHBV-NRE-G1620C-luc, were co-transfected with either an empty vector or HBx expression plasmid into HepG2 cells, followed by luciferase assay (n = 4). 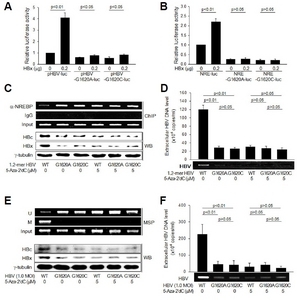 (C) HepG2 cells were transfected with 1.2-mer WT or its derivatives, 1.2-mer HBV G1620A and 1.2-mer HBV G1620C for 48 h in the presence or absence of 5 μM 5-Aza-2′dC. 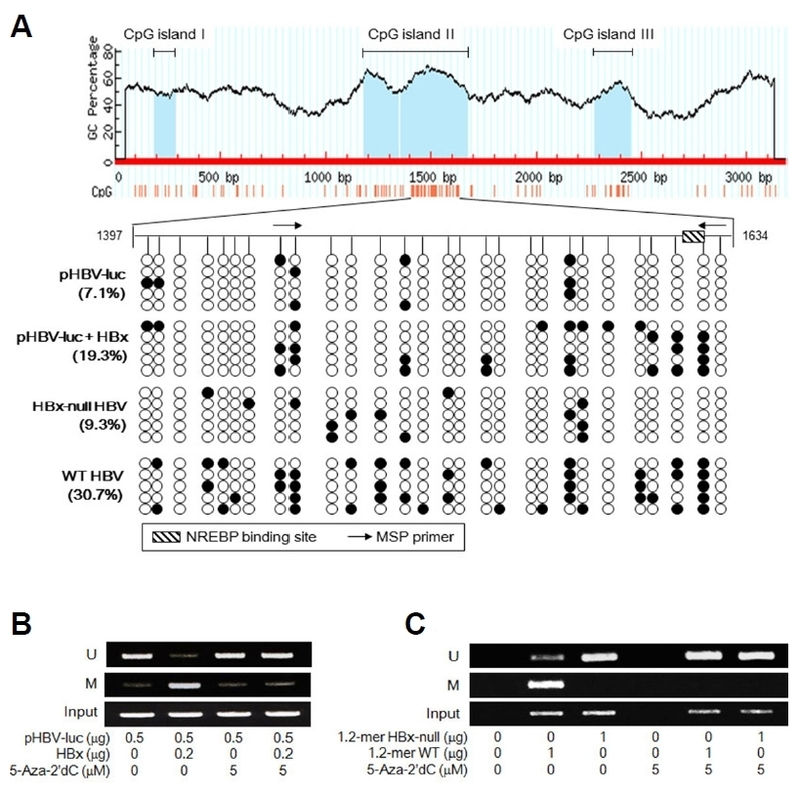 Levels of NREBP bound on the NRE in HBV cccDNA were determined by ChIP assay (upper panels). Levels of HBc and HBx were determined by Western blotting (lower panels). (D) Levels of extracellular HBV particles released from cells prepared as in (C) were determined by IP-coupled conventional PCR and real-time PCR (n = 4). 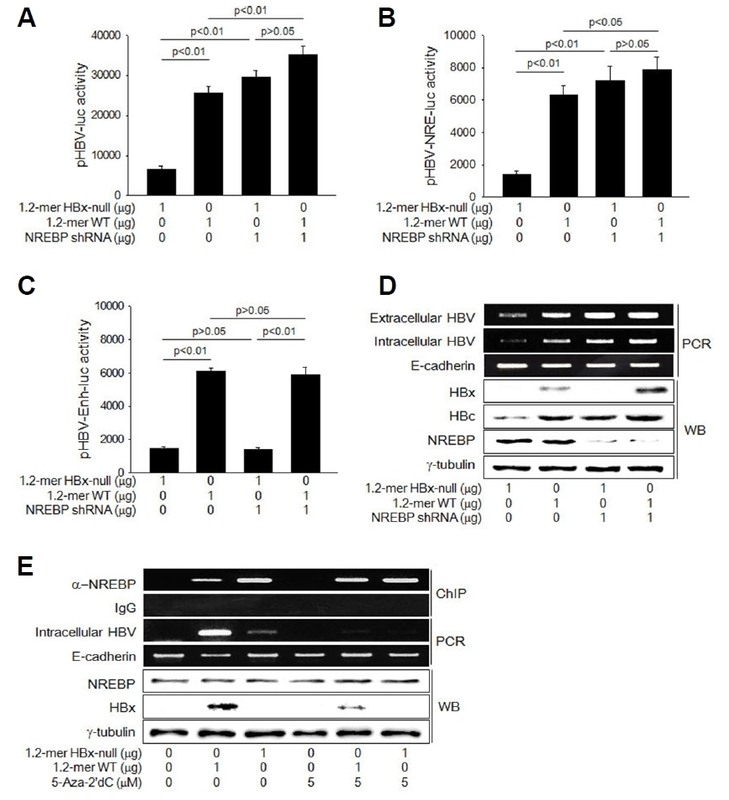 (E) HepG2 cells transfected with the NTCP expression plasmid were infected with the indicated HBV at an MOI of 1.0 for 48 h, followed by Western blotting. (F) Levels of extracellular HBV particles released from cells prepared as in (E) were determined by IP-coupled conventional PCR and real-time PCR (n = 4).